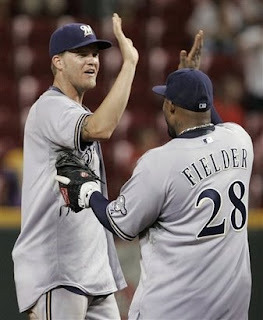 Brewers Keep Pace With Win Over Reds ~ The Bucky Channel - The World of Sports from Wisconsin's Perspective. I must apologize, as you're not going to get much of a Brewers recap tonight. I want to write about how glad I am the Brewers took two of three from the Reds, and have now won 4 of their last 6, but as you can understand, my mind is full of thoughts of Favre right now. So I'm going to leave it short and sweet. The one thing I will say though, is that we need every win we can get, because it seems like the Cardinals and Cubs have decided never to lose again, ever. They do play each other this week though, so we'll see what happens. As for tonight, I'm just happy for the victory. And what the hell has gotten into Jeff Suppan? TBC's Player of the Game: Rickie Weeks.